Tenkara is a traditional Japanese method of fly fishing that uses a long rod with a line attached to the end; no reel. It is fundamentally simple and intuitive to learn. However, tenkara can take years to master the subtleties; the perfect cast in windy conditions, that small eddie protected by branches, and the complex currents that stand between you and the fish. Tenkara is a beautiful mix of tradition and cutting edge technology. We are the first fixed-line fly fishing guide company in the western hemisphere. At Tenkara Guides, we provide a first-rate guided experience using unique, effective, easy to learn methods of tenkara based fly fishing. Our professional guides will design a unique trip customized to your schedule, level of experience, and craving for adventure. 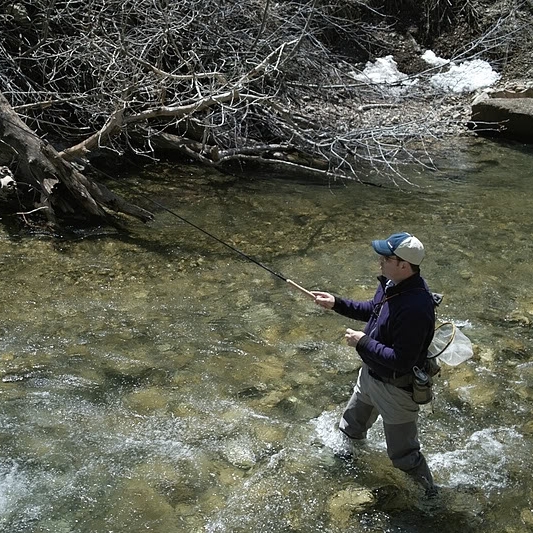 ERiK began using Western fly fishing techniques for trout, but fell in love with the simplicity and effectiveness of tenkara. ERiK is a guide who enjoys exploring new rivers and applying fly fishing techniques from around the world to tenkara and the waters of Utah. Passion for fishing, guiding, and teaching tenkara defines ERiK. John grew up in the high mountains of Park City, Utah and has been fly fishing the mountain streams of Utah since early childhood. He has been developing a new form of fishing he calls “Urban Fly Fishing”. There are waterways in almost every urban environment that hold healthy thriving fish. John is using Tenkara techniques to discover unknown fisheries in the most unlikely places. He believes you can fly fish in almost any city in North America a few minutes travel from where you live or work and tenkara is the perfect tool. Rob has had a fishing rod in hand for over 20 years. An avid angler, world traveler, backpacker, and wilderness medical professional, he enjoys going off the beaten path to find the best fly fishing possible. He is passionate about fishing tenkara in remote mountain streams. In addition, Rob takes great pride in combining techniques learned while fishing six continents and four oceans to create hybrid fixed line fly fishing styles that simply catch fish. Master angler Masami “Tenkara No Oni” Sakakibara travels to the United States to teach his famous Oni Tenkara in a three day course to a limited number of students.